Electronic Music world in 2011 saw a brilliant album It’s Artificial by Andrew Bayer. An album with different styles which didn’t fit in one particular genre within electronic music but rather transgressed it into something beautifully unique. It’s Artificially was an agglomeration of different musical styles – glitch hop, progressive trance, progressive house and etc. 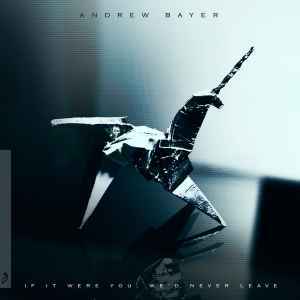 If it were you, We’d never leave is the second album by Bayer, released under the giants of trance music – Anjunabeats label. In this album, Bayer completely deviates from his first album. The album leans more towards the downtempo vibes, evoking nostalgic and personal memories of Bayer, which he hopes to manifest into the listeners. The album sports female vocal guests, accompanying wonderfully with Bayer’s peculiar production. It’s a top notch album that yearns the listeners to get fully soaked into the journey. This is nothing like It's Artificial, so don't expect it to be. Personally, I think the album is good, not as good as his first release though. There is no track to me that really stands out. Bayer does a good job with some of the downtempo songs, but I've heard better from other artists. I understand that he is probably trying to expand his repertoire, and this is a solid effort in that direction. This is definitely worth a listen.